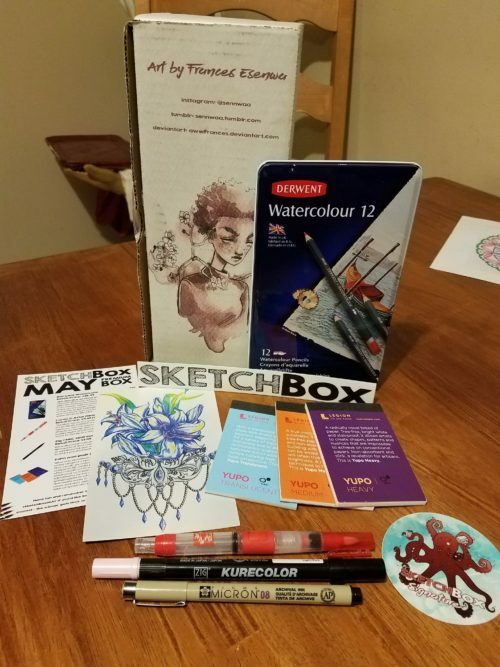 Every month, I receive a Sketchbox. This month, I have the premium box for $35 plus $5 shipping. The basic box is $25 plus $5 shipping. When you look at all the products inside, they all retail for around this. Now there are things that come every month, this includes; Sketchbox Sticker, Artist of the month box, Artist of the month tile, and a product description card. I will go through each of these items in detail below so that you can see what you get for the price. Now I did the unboxing on YouTube, you can find that here. Even though I did a visual unboxing, I am going to go through everything that was in the box. I am very excited about these watercolor pencils. I have heard great things about them and have watched many YouTube videos about different ways to use them. When I write my art supply review, I will update this page to link to it so you can see exactly what can be done with them. This water brush is essential for watercolor in general, I can’t imagine how it will help with watercolor pencils. I can’t wait to do an art review on this brush as well. The one thing I will tell you is that the feel of this pen is very nice. I enjoy the fact that there is a push button to deliver the amount of water that you need. It also has a syringe type canister that allows for easier filling. “We included this double ended marker to allow you to fill in parts of your completed piece with the brush end or add line work and detail with the bullet end. Use it to add a polished look to your piece.” – Product description card. I don’t know too much about this marker. I have actually never even heard of the brand. I have a few tests that I like to complete when I do an art supply review. I think until I can complete this I shouldn’t make any assumptions. However, It looks like it does specifically mention manga, which I have no knowledge of. “What sets sketchbox apart is the ability to compare an entire range of a brand’s offering – not just one item. This month we included the full range from Legion’s unique multi-media paper. Painting or drawing on the ultra-smooth surface of YUPO is different from regular watercolor or drawing paper, and will require some adjustments by the artist. YUPO is a synthetic (polypropylene) substrate with a non-porous surface that repels water so you can create, re-create, wipe clean, and start again if you’d like. It’s a truly unique take on watercolor paper and perfect for this month.” – Product description card. The one thing that I will note with this is that a full pad of YUPO paper is well over $50 each. I haven’t ever heard of this paper but I do want to note that this paper brand is “tree-free”, as is mentioned on the front of each of the notepads there. This is a huge bonus because you can’t find these mini pads anywhere. I love that we are able to receive exclusivity on some art supplies. I will do my best to do some research on these paper types and try to do a quality review for them. When I complete it, I will update this post. If you would like to get your hands on this sketchbook, or any in the future, please use this link so that I can get a credit to use towards next month’s box.